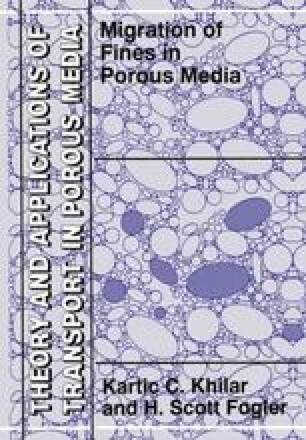 In the previous chapters we have discussed the release of fine particles from the pore surface to the liquid stream flowing through the porous medium. These fine particles while flowing with the liquid phase, can either readhere to the pore surface or flow without capture or get entrapped at the pore constrictions. The later occurrence leads to the plugging of the pore constrictions. In the migration of fines, the later two occurrences are more common as the colloidal and hydrodynamic conditions that bring about their release are not likely to allow these particles to readhere back to the pore surface at the same conditions. Therefore, during the migration of fines in porous media, the released fine particles either get entrapped (entrapment of fines) or migrate without getting captured (piping or washout of fines). Whether entrapment or piping occurs will depend on parameters relating to the characteristics of the fine particles, the permeating liquid (suspending medium) and the porous medium. This chapter describes the factors affecting the entrapment or piping of fines. A mathematical model to predict whether entrapment or piping occurs or not is also discussed. Finally the model is applied to some important processes where migration of fines occurs.